How many boots has Jack and why does he wear headphones and collects music notes? Where has the idea for Jet Boot Jack, Timeslip and The Berks Trilogy came from? What is a Knuckerhole and why is it a title of the sequel of the Jet Boot Jack for Commodore 64? In a very nice chat with me the creator of above games for 8-bit computers and many others for NES, SNES or PS, explained this all and many other things. 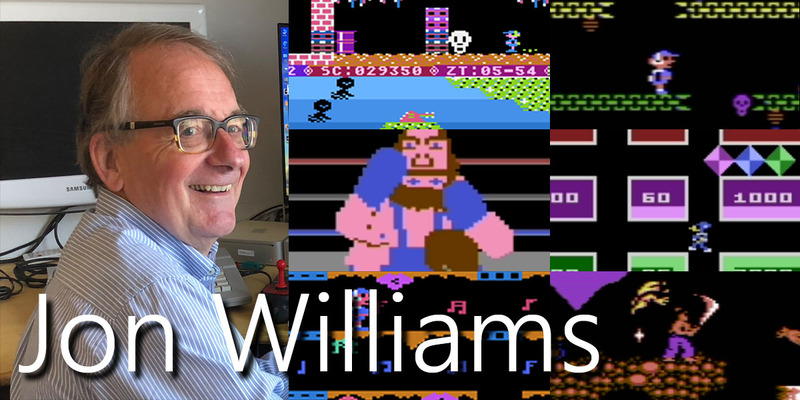 Mr. Jon Williams – the author of real classic games that we played in the eighties and in the next decades, the co-creator of the games for Disney. Read about it and about what he did for the next years when he abandoned Atari and Commodore computers to start creating games for Nintendo Entertainment System. Read how his work looked like and why did he start coding on the Atari 8-bit again. GadZombiE: Hello Jon. When I was a kid I had Atari 800XL and Jet Boot Jack was one of my all time favorite games! I just love it for about 30 years! 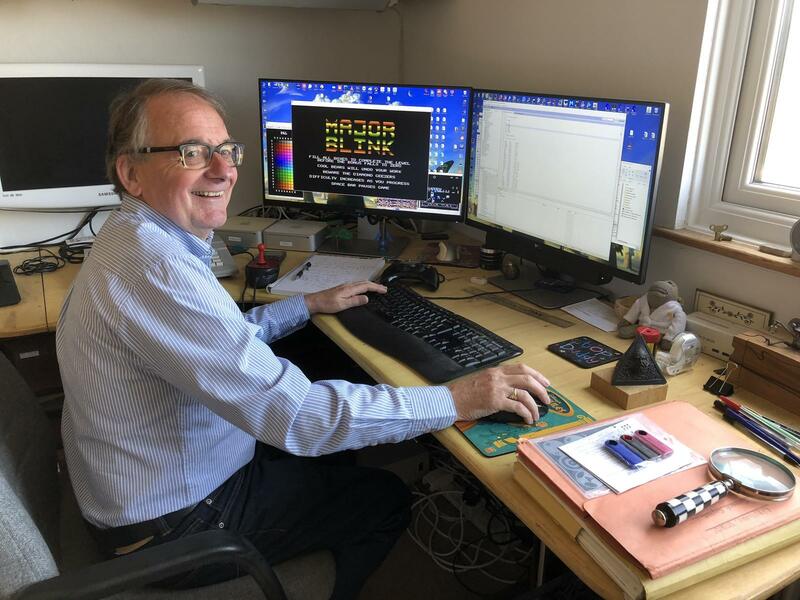 Jon Williams: I’m glad you enjoyed Jet Boot Jack .. it was great fun to write and got me into a career of games programming. G: Where did you get the idea for Jet Boot Jack? It’s not common to see a boy on only one boot – and it’s a jet-boot! As far as I know, he is in some kind of music store or something and he collects records. Or just notes? I’m not sure. J: I have to be honest and say that the idea for Jack’s Jet Boots really came about because I wanted an easy way to move my main character around the screen without having to worry about animation. 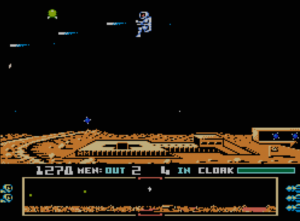 The size and resolution of the Atari’s player / missile graphics limited what I could do so I decided to simply ‘slide’ him around the screen by jet power. I think there were already a few games where the main character used a jet pack so the jet boots seemed a good compromise. The character does actually have a pair jet boots not just a single one … I know that doesn’t come across on screen as Jack is generally side on. There could be some confusion as the English phrase ‘Jet Boot Jack’ does make it sound singular but saying ‘Jet Boots Jack’ isn’t correct in English. G: Is there any chance to get back to Jet Boot Jack and maybe to make a sequel, like Jet Boot Jack 2? This game has only one disadvantage – it has only 10 levels. It was enough for me back in the days, but today I can finish it in 10 minutes. It still gives me much fun but it would be so great to play in some different, new levels. Do you think it is possible? Of course still on the Atari computer (yes, I know it was also for C64). It could be also on C64 but I still think the Atari version is better. J: Earlier this year I spent a lot of time converting all of my old Atari and Commodore floppy disks to the PC. Unfortunately, because they were so old, some could not be rescued. Luckily I managed to convert the source files for my main games and most of these now assemble on the PC and run on the original hardware. I had always wanted to convert some of my Commodore 16 games to the Atari and two of these have now been finished. They were straightforward conversions and I’m now working on a greatly expanded version of my best C16 game, Berks 3. Once that is finished I’ll probably convert the new version back to the Plus 4 as I know there are still a lot of people in Europe who love the machines. I’ve always wanted to revisit Jet Boot Jack for the Atari. I did write a follow up on the C64 called ‘Legend of the Knuckerhole’ – this was one of my first games for the C64 and there were quite a few things I wasn’t too happy with. The current plan is to take the better parts of the C64 game and add some new elements to create a new Atari game. 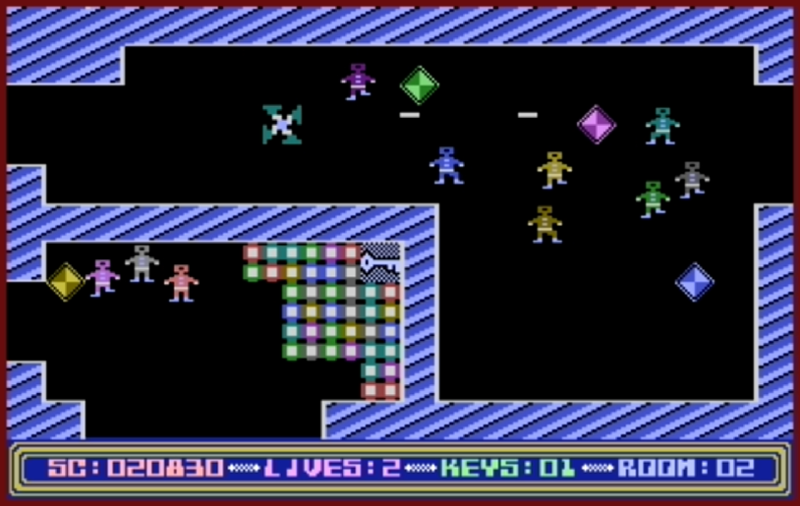 I’ve also got my original JBJ Atari code assembling on PC and thought about creating a version that contained the original 10 levels plus an additional 10 levels with some new game mechanics. I think it’ll be mid next year before I’m able to start anything new for Jet Boot Jack. 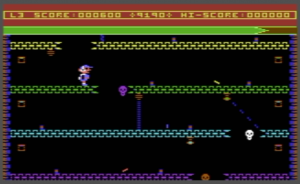 G: I can’t wait to see the enriched version of Jet Boot Jack for Atari! It’s like my dream come true. I’m completely sure I will play it a lot when you finish it! Do you remember what was your inspiration when you were creating this game? I mean the main game mechanics – elevators, monsters hanging on the ceilings etc. How did you start to write this game? J: Jet Boot Jack just evolved while I was exploring the Atari hardware and was the result of lots of small test programs I wrote. 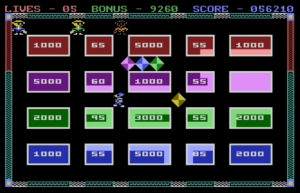 The game was always going to split the screen into horizontal areas so I could use the Atari display list interrupts to create more colour and reuse the player / missile graphics. Once Jet boot Jack was moving horizontally I needed a way of moving him vertically without worrying about animations. I experimented with the elevators and after a lot of work they made it easy to move him around the level. The monsters came later when I wanted to use the spare player graphics. I used the interrupts to reposition monsters down the screen and could change colour and type. To be honest, nothing was planned like that at the start – it all evolved over time. G: And what about the tune in this game? Who composed it? It’s very memorable! J: I did write the music for Jet Boot Jack myself. There were no music player systems available at the time so I think I just wrote a player that took data to controlled the notes and durations and hand coded in the tune. I seem to remember writing the tune on a piano and then transferring the notes and chords into data. Everything was done by hand in those days, even the packing of the screen data was manual. G: Many game authors in the eighties had to create everything themself. In Poland it was very common that the only one person was a programmer, musician, graphician and whatever needed else. So I understand that you had to compose the music, but it’s very cool. Today I have it in my head and it will be there forever. J: I’m glad you liked the Jet Boot Jack music, I think I may try to update it if I do write a follow up game. I will certainly let you know when I start work on another Jet Boot Jack game, I think it might be a long job as I want to make use of the additional memory on the 64K machine. G: Why Jet Boot Jack for Commodore 64 was made by someone else, not by you? 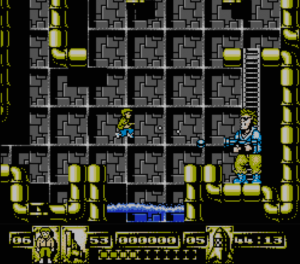 J: There were 4 other versions of Jet Boot Jack; the C64, BBC, Amstrad and Acorn. The publisher wanted me to do the extra versions but I didn’t want to have to learn new hardware. He found programmers to do the conversions – I received a small royalty for each sale so I was happy. G: I have seen many JBJ versions on many platforms. All of them looks very similar to Atari but they aren’t as good. The biggest problem is the lack of smoothness of the original game. 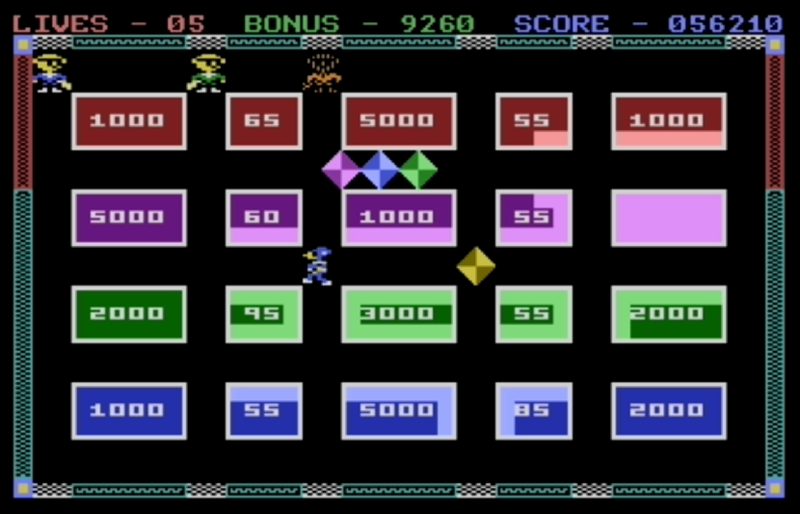 And the Atari version is the most colorful. J: I had no control over any of the conversions and just supplied my 6502 listings and some hand drawn graphics. I only played the C64 version and it wasn’t too bad … although there were a few things I would have liked to see improved. G: Let’s speak about The Legend of Knucker-Hole. I didn’t know this game before. Now I played it for a while and I really like it. Was this game popular in it’s time? What do you think about it today? You said that you’re not completely happy with it, but why? J: I think the game did fairly well but it came out at a time when the C64 market was flooded with new releases. 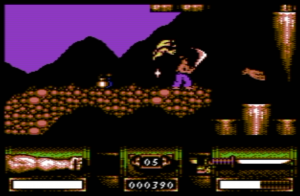 It was my first real platformer on the C64 so I had to learn lots of new stuff – I think it turned out ok in the end. I wanted to do a game with lots of variety so started off with the vertically scrolling section, this was the area I was never happy with. If I do convert the game for the Atari I’d change this section as it was a little too predictable and repetitive. The horizontally scrolling section was a lot better… my only regret was in making it too hard. I think I’d change the collision system so you could continue if you had a minor collision … maybe just losing some health rather than immediate death. I think it would be possible to convert the game to the Atari but maybe take the best bits and add some new content. G: Probably you’re right about the repetitiveness of the first 3 levels but… it was very common in those games, so I still like it. But level 4 and 5 are different and I must say I like the fifth the most. The only thing in this game I don’t really like is the walk animation of player’s character. I rather like Jack on his jet-boot than when he walks. J: I agree with you about the walk animation in Knuckerhole, that’s one thing in particular that I didn’t like. I think if I revisit the game I’ll try not to have Jack walking around… any walk animation on the Atari would probably look even worse due to the graphical restrictions. The Jet Boot Jack walk was my first ever attempt at human animation and I soon realised I was a better programmer than artist. I did have the good fortune to work with some brilliant artists, animators and modellers later in my career. G: And what does mean the title of this game? The Legend of the Knucker-Hole? What is a Knucker-Hole?? J: The Knuckerhole is the name of a large pond in a church yard near to where I was born. There was a local myth that it was bottomless and the home to a dragon … I don’t think anybody has seen it recently! With hindsight it was not a good name for the game and something that would change for the Atari. G: You said you’re retired now. 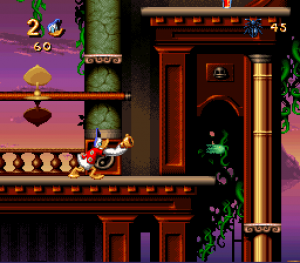 So, can you reveal how old are you now and how old were you when you made Jet Boot Jack and how long did you create video games at all? J: I’m very old … 67! I retired from games computing about 5 years ago having worked in the industry continuously from about 1984 after Jet Boot Jack became successful. The Atari market became very small in England so I moved onto the Commodore C64 and was also asked to write some games on the C16 and Plus 4. I wrote lots of games for the C64, some of them were terrible but I needed the money being a freelance programmer 😉. 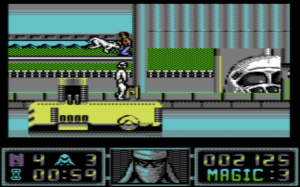 Some of the better ones were: Back to the Future II, Knight Games, Shadow Dancer and First Samurai. Samurai was the last C64 game I wrote before moving on to the NES and SNES and from there to PlayStation and Xbox. The whole games industry changed with the modern consoles and I moved from programming to become a producer. After writing Jet Boot Jack I did write again for the Atari but that was a language program to teach English people Spanish, French, German and Italian. After that was released I was asked to move to the C64 by my publisher. He originally only sold Atari programs but found that the market had become much smaller as the Sinclair and Commodore computers became more popular. I wrote some C64 games and then some for the C16 / Plus 4 … the last of these was Timeslip and I did manage to get the publisher to agree to release an Atari version. I should add that I had a small utility program called A.C.E. (Atari Cassette Enhancer) released before Jet Boot Jack and this added a few features to the Atari’s poor cassette system. I also wrote a menu disk utility called Multiboot which was given to a few friends and this spread far and wide. The program allowed the user to copy multiple programs onto the disk and boot them as if they were the original. G: I’ve seen some of your games for Commodore 64. The First Samurai looks incredible. I love this game for Amiga and PC but for C64 it’s impressing. What did you make for other platforms? J: The C16 games were Berks, Major Blink and Berks 3 (these also got rereleased as the Berks Trilogy), Frank Bruno’s Boxing and Timeslip. My first work on the NES was to finish a game that somebody had started but then left the company – this was James Bond Junior. I then converted Archer Maclean’s Dropzone to the NES and also the Gameboy! 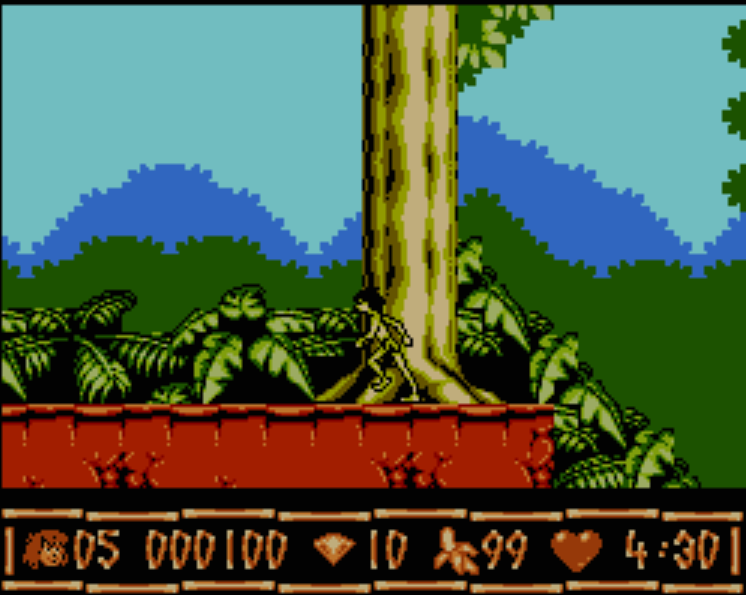 The last game I wrote for the NES was Jungle Book (one of my favourites). I moved onto the SNES and converted Brutal (a fighting game) before writing an updated version of Dropzone called Super Dropzone. 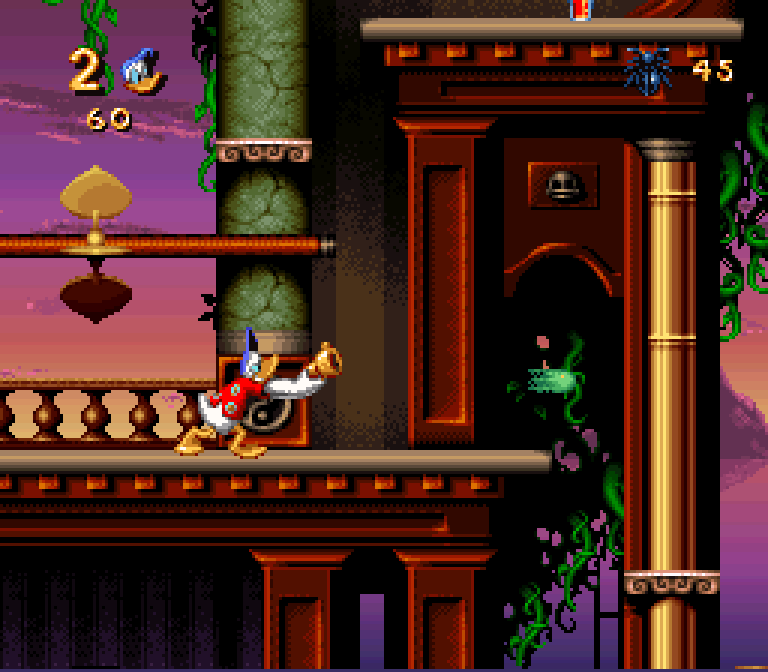 My last game on the SNES was Maui Mallard: Cold Shadow – this was one of the hardest games I was ever involved with and at the end I was working over 12 hours a day, 7 days a week. G: Dropzone was always one of the best shooters for Atari. Your conversions are great! I played them on the NES and GB. 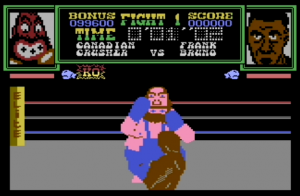 They have very similar gameplay as the original by Archer MacLean. So you were working in Eurocom? J: I met the people that started Eurocom on First Samurai – they did the graphics for me. When Samurai was finished they asked me to do some work for them and I stayed with Eurocom until I retired … which was when Eurocom sadly went out of business. They were very hectic times but I look back fondly at the trips to see Disney in the USA and the work we did on things like Harry Potter and Ice Age. G: So it looks like next years you worked on Disney’s games. I believe it was hard and great work for you! Could you now say that you were a kind of leader in your company? Or producer, or even a director? It sounds very serious! J: Eurocom’s involvement with Disney really came from the initial games I wrote for them on the NES and SNES. When Maui Mallard: Cold Shadow was finished Disney decided to expand their own internal software house and we worked alongside them to work on some titles. We had more experience in making games and ended up taking on the next few major Disney titles (Hercules and Tarzan) ourselves … I don’t think their internal team was very happy. Eurocom did work on lots of different genres but I was mainly involved with games targeted at the younger market. I had to move and work ‘in-house’ at Eurocom because it was becoming impossible to write a game at home. The newer consoles needed larger teams so I became a Producer in charge of a team. This started at about 10 people but was up to a 100 or so by the time I retired. I did get to work on lots of high profile games (Crash Bandicoot, Spyro, Harry Potter, Pirates of the Carribean, Ice Age etc) so it was worth all of the hard work. G: If we’re talking about Maui Mallard: Cold Shadow, could you explain why this game has different title in other countries than USA and in the USA Donald Duck doesn’t have his name? J: When we first started the Maui game it was going to be Donald Duck. For some reason near the end of the project Disney decided that they would create a new name for the character. This would have been decided by somebody in the Disney marketing team – it might have been that they thought the things our character did in the game didn’t suit Donald Duck or they just wanted to create a different character. The different game titles would have been because each territory had control over how a character ‘worked’ in their area. To be honest, it was very difficult working with a company like Disney as everybody wanted to have their say on game content. The last game I ever worked on for Eurocom was Disney Universe and that was even more complicated than Maui. 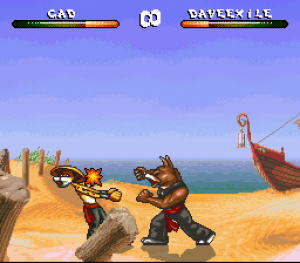 The game brought together lots of classic characters and mixed them with characters from movies. For example, we had Micky Mouse and Goofy alongside Jack Sparrow, Peter Pan, Nemo, Wall-E and lots more. Each character model we created had to be approved not only by Disney but by the company that held the movie production rights. It was a nightmare to get everything approved. G: I have found some informations about you a few days ago, so I know about Linkword German (although I have never played it) and ACE and Multiboot. But the only games I really played was Jet Boot Jack and Timeslip. And Timeslip was another great game. Do you remember how did you get the idea for this game? It’s very unusual – it looks like 3 games at once. Did Timeslip conquer the market? And is this really Jack from Jet Boot Jack in the middle part of Timeslip? J: Timeslip came about because I wanted to write another original game for the C16. The Berks games were based on single screen action so I decided to try a scrolling game. The C16’s memory was so restricted I came up with the idea of just scrolling a portion of the screen. 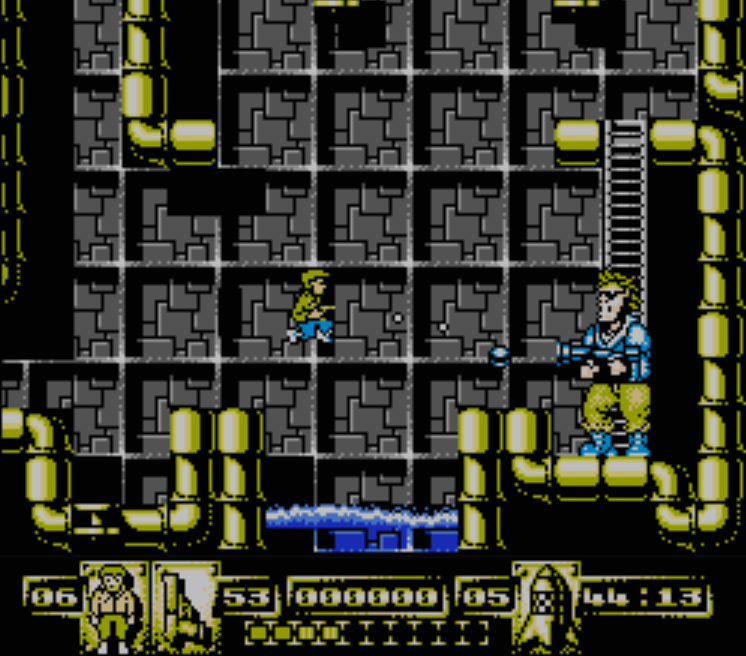 This evolved into the three separate scrolling areas in the final game. I tied it all together with the idea of having to collect all of the clocks in each section and that led to the name Timeslip. Yes, that was Jet Boot Jack in the central area … I used him because it made the game play easier to write. The C16 market was very limited so it didn’t make me a lot of money but I was working as a freelance programmer so any income was good. I did the Atari version as it was quick to convert. Again, it didn’t sell particularly well as the Atari market had all but disappeared in the UK. G: I played your new conversions from Commodore 16 to Atari 8-bit: Baby Berks and Major Blink. I like Major Blink very much. Will you convert the last part of Berks Trilogy too? J: I’m currently working on the conversion of Berks 3 to the Atari but it will almost be a new game. The original had 30 rooms to explore but the new version has over 100. I’m hoping it will be finished in a month or two. G: Major Blink is so colorful. But I think the difficulty level should increase faster because I’ve gone through about 7 levels and it was too easy. I saw it for C16 and I think its faster. Did you notice that? 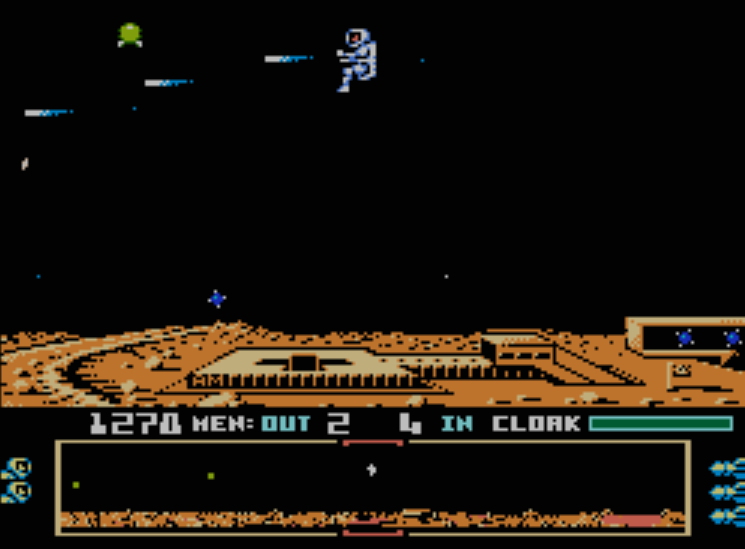 J: The difficulty setting was different on the Commodore machines as there were more enemies. For the Atari, I wanted to make it fairly easy for people to play for a while before it became too difficult. I think it was probably too easy. I’m sure people won’t think my next Berks game is too easy, I’m finding it hard to play myself. G: And why the Baby Berks isn’t a part of Berks Trilogy? It looks even better than the Berks. J: The Berks Trilogy was Berks 1, Major Blink and Berks 3. When Berks 3 had been released I was asked by a Commodore magazine to produce a cut down version of the game that users could type in from the listing! Baby Berks was heavily simplified but did work quite well. A few months later I produced a version with a few improvements that was designed for the budget market. 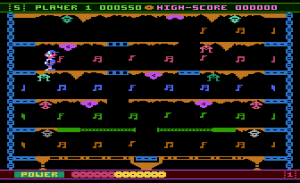 When I recently converted the games for the Atari, I started with Baby Berks as that was the smallest and easiest to do – I did improve a few things but it wasn’t as polished as Berks 1 or Berks 3. G: Your career seems very impressive! It looks like last 30 years of your life were related to games. I will not believe if you tell me that you don’t like to play games! So, what was (or is) your favorite game? Was it for Atari computers or something different? Or maybe you have something favorite from more modern games? Do you still play video games? J: When I was working for Eurocom I had so little time to play new games but my favourites were platformers like Ratchet and Clank. I have to admit that I rarely play games now. I can’t get into online gaming so anything I play has to have a one-player mode. I guess I still prefer the older 8-bit games. G: What about your favorite game in the eighties, when we had mostly 8-bit games? J: My love for games started with the original arcade machines, I spent many hours on these and used up a lot of coins! I loved playing Space Invaders and that was my first attempt at machine code programming on my old Commodore Pet (my very first computer). I also liked Galaxians, Defender, Breakout, Donkey Kong etc. I think I stopped playing the arcade machines when they became too complicated and were designed to eat through your money. When I moved onto the Atari I played games like Shamus, Boulderdash, Caverns of Mars, Dropzone … and many others. Sometimes I only played a game for a few days before moving on to something new. G: Have you been thinking about converting your games to some more modern platforms like iOS or Android? Some game developers did it and they converted their old games i.e. to smartphones. J: I did have an Apple Developer license for one year after retiring as I considered writing for the iPhone & iPad. I managed to get some test pieces working but I just didn’t want all of the other stuff that’s involved with releasing mobile games. That’s why I moved back into the old 8-bit scene. I initially wanted to preserve as much of my old, original code as possible and that led me on to writing the C16 conversions and now I’m writing new code. I know that I can write something and upload it for free and not have any worries. There seems to be a lot of people still interested in the old 8-bit hardware and I’ve seen a few new games that look really good. Some of these games have been written by teams rather than just one person and I know I won’t be able to compete with that. However, I’m writing my games as a hobby now and really enjoying it. I find it keeps my mind active 😉. G: I also can’t get used to the smartphone games. I’d rather like to see new 8-bit games than the best games for Android. Do you know that Polish 8-bit scene is still alive? There are plenty of great new titles made this year and recent years too. J: I noticed the Polish scene when I was searching for information a year or so ago. There also seems to be a good German Atari scene. My background before computer games was in electronics; I used to repair televisions, radios, video recorders … anything electrical. I was interested to see that there’s a large Polish hardware scene for the Atari too – I’ve already upgraded my 130XE although I normally do everything on the Altirra emulator. It’s good to see that people are still writing for the old 8-bit machines. I have a friend from Eurocom who tells me he is writing a few small games for the Dragon and Tandy machines. I realise there’s still a larger number of people writing for the C64 but I’ll stick to the Atari. G: I’m sure you have written your games for Atari and Commodore in machine language but what about NES, SNES or PlayStation? What language did you use? I was always wonder how programmers make games for such consoles like NES, where casual player has only a joypad as input and cartridges with games. Could you tell me something about it? J: I worked in machine code for all of my games on 8-bit machines and also on the SNES. When I started to work in-house at Eurocom we had to have larger teams for the PlayStation and Xbox consoles and these were written in C (and later in C++). G: Wow, so your work at NES and SNES games looks pretty complicated. Could you tell about it more? J: The way we created the games at Eurocom changed greatly over the years. When I first worked with them I was a freelance programmer and worked at home, many miles away from their office. For the SNES and NES games they would send disks by post containing graphics and music and I would create builds and send them by post for testing. After a while we were able to send data both ways via modem but it took many hours. When we moved onto the newer consoles I had to move house so I could work in the office alongside the graphics artists and other programmers. We started off by using tools that we wrote ourselves to create environments, animation, character models etc and the artist would output the data to a server. The programmers had a system that ensured nobody could work on a file at the same time … this was before systems like SourceSafe was available. We then had a PC that took all of the code and data and created the binary files for testing. As the consoles became more powerful our system evolved to allow multiple programmers and artists to work on their part of the game and when they checked in their files a bank of rack mounted PC’s would pick up any changes and automatically output these into their individual binary files. We could trigger a new build at any time and this would compile all of the code and combine it with the graphics & sound data to produce a final binary which was placed on the server. The main system was pretty complex and made more difficult by the fact we had to produce builds for each of the consoles the game was targeted for along with different versions for certain territories – for example, many games would have PAL, NTSC and Japanese versions for each console. I think the largest number of SKUs we worked on was about 20! It’s so nice to get back to my 6502 roots where I can assemble and test the game in seconds. G: What is the difference in creating a game for NTSC or PAL system? I know both use different frequency, so it has an impact on the speed of a game and both has a bit different colors and size of the screen. J: The biggest problem with producing games for the PlayStation, Xbox and Nintendo (and a few PC versions too) was the number of different language versions we had to build. When I worked on the NES and SNES there were generally 3 versions; PAL for Europe, NTSC for the USA and NTSC for Japan (the Japanese versions always had a few changes that were needed for their different culture). By the time we were working on our last games we had multiple PAL versions with different languages, Japanese, US and sometimes special cases for Canada, PAL Brazil etc. Each version had to be built and tested separately – the publishers handled the localisation testing but we would often have to rebuild one or more language when they found a translation error. I remember one version of Pirates of the Caribbean had to be resubmitted at the last minute as they had translated something into a swear word! The changes between hardware on the 8-bit machines did sometimes cause problems. The first time I encountered that was when English Software sent Jet Boot Jack to somebody in the US for testing and it wouldn’t work. It turned out I was running too much code in the vertical blank interrupt – the available time was shorter on the 60HZ machines. I made a few simple changes and all was good. There was no way we could easily test NTSC versions in the UK during the 80’s. I used to repair televisions as a job before writing games and we joked that it stood for Never Twice the Same Colour. The US system could allow colours to change when the TV warmed up causing a colour shift – that’s why they had a hue control. In Europe we had the PAL system which compensated for that. Of course, nowadays there are no problems with either system. G: It sounds very funny with the wrong translation in Pirates of the Caribbean! Do you remember some other funny stories from your past work? J: I don’t remember too many stories, although one of our Directors did throw up over a topiary bush of Pluto while we were visiting Disney in LA – he was very, very drunk! I’m not too sure If you’ll understand that? At the start of our work for Disney they treated us very well when we visited and took us to Disney World, Disney Land, expensive restaurants … and a few strip clubs! They also invited us over to the US for a wrap party for Maui Mallard: Cold Shadow … they spent a fortune on the party and I do remember being on a small stage with a man in a Donald Duck suit! They were good days. G: What is your favorite platform to making the games? Atari, NES, Plus 4 or something else? J: My favourite hardware to write for has to be the 8-bit Atari, that may be more for the nostalgia. Developing games in the 1980’s was interesting as it was all very new. There were limited tools to help – I remember when I got a copy of Synassembler for the 800 it helped me to do things so much quicker. However, I loaded it up recently and realised how awful and slow it was – when you scrolled code off screen you couldn’t scroll back in the other direction. You’d have to stop and List the code again. Now I just scroll up and down in Windows and swap between source files in seconds. I did manage to speed up my C64 and C16 game development by connecting from my Atari joystick ports to the Commodore user port … I wrote the games using the Atari and transferred the code to the Commodore with some utility software I’d written. J: The Atari to C64 connection came because I was going to write my first game on the C64 and couldn’t find a good assembler. Also, when you assembled a program it would have to be sent to disk and then loaded from disk to test and run (as the assembler was using lots of memory). I suddenly though that as the code generated was effectively the same for both machines I could continue to use my Atari machine if there was a way of communicating between the two. I had previously experimented with the user port on my Commodore PET so knew that it could be used for input/output – I then found that joysticks 3 and 4 on the original Atari 800 could be used to output data as well as for input. I wrote a system which had small machine code handlers on each machine … when the Atari assembled it sent the data to a device handler that I’d written which forwarded the code to the joystick ports. There was some simple handshaking and error checking but it was a very stable system. I also wrote a map and sprite editor that ran on the C64 but could send the data back to the Atari for including in the assembly. Many years later I was using a similar professional system on the PC that connected to the C64 – it was much more advanced than my system but I’m happy that mine saved me so much time in the 80’s. G: Can you count how many games have you developed which were released and sold? J: I think I wrote about 12 original games and another 18 as a freelance programmer. For example, Shadow Dancer and First Samurai were C64 games where the developer contacted me and asked if I would write the games for them. When I started to work for Eurocom the games took much longer to write and I was responsible for 10 titles but also helped out on quite a few others. G: So it looks like one game could take even a few years to make it finished? J: Most of my early games were written in 3 to 6 months apart from the C16 games which only took 4 to 6 weeks. I always had problems getting paid by publishers so usually worked on a couple of games at the same time. I think many freelance programmers had trouble during the 1980’s and 90’s. 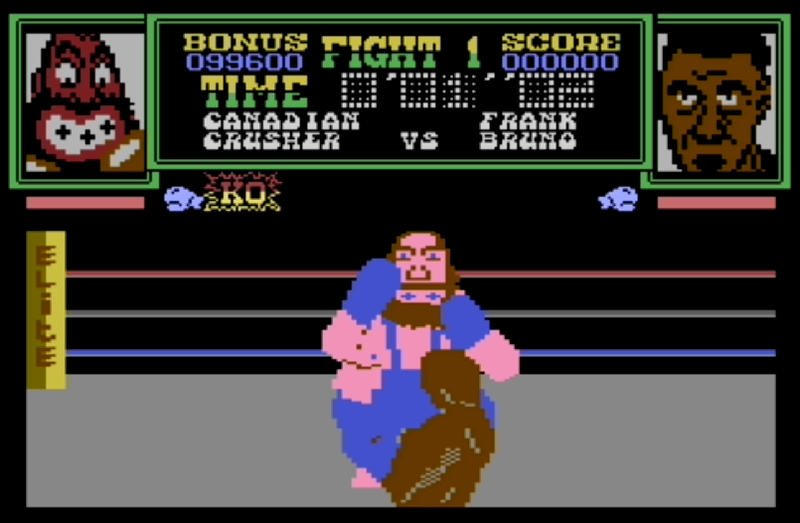 Some of the later C64 games did take longer but that was sometimes because I would be waiting for graphics to come in from the artists – by that time the publisher paid for an artist and musician. When we started writing the games for Disney the games they took a lot longer. Disney had a US company creating animations for use in the game and they had to go through all sorts of approvals processes. By the time we were working on PlayStation, Xbox, GameCube etc each game would take a year or so. G: What are your plans for future? Are you gonna make new, great games for Atari? Or other computers? You mentioned Knuckerhole, Jet Boot Jack, Berks. Something else? I’m excited for all Jet Boot Jack sequels or new versions! Everything will be great! G: I like your plans for the near future. I will be waiting for any game you create. Thank you very, very much for your time and all those great stories. I look forward for any information about Jet Boot Jack and the Knuckerhole for the Atari computers!